This study explored how local NGOs and community groups act towards sustaining NGO social interventions at community level. It sought to understand why it is so difficult to sustain benefits that accrue from NGO work. Exploration was made into the assumptions behind NGO social interventions, nature of benefits, indicators, and broadly into strategies used by community groups and local NGOs towards benefit-sustainability. Findings reveal a number of dilemmas for NGOs and community groups to pursue benefit sustainability at community level. These dilemmas were concealed in a toxic mix of aid chain dynamics, community groups‟ dependency syndrome, and local NGOs lack of proper methodology to gradually withdraw from group support. Despite of these dilemmas and toxic mix the study recognizes that local community groups if availed with relevant information, skills and a stable less conditioned source of income can embed local NGO social intervention benefits into their own existing community structures, and pursue them for a prolonged lifespan. In the same way, local NGOs depending on their nature of relationship with the funding agencies and the government are able to respond creatively and strategically to external pressures and demands, and put in place strategies geared towards benefit sustainability. 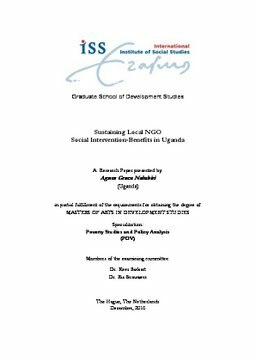 -- Relevance to Development Studies -- Sustainability of NGO benefits is a key to alleviating abject poverty in developing countries; however attempts to address this challenge remain futile. There-fore, documenting approaches employed towards addressing this problem is essential to lay grounds upon which further reflection into the topic can be made. In addition, literature related to sustainability in community development is largely focused on NGO financial aspects: Insufficient research has been done on how NGO benefits can be sustained in communities for a life-span beyond the funding agency. This research will therefore supplement on the already existing literature about the topic, and hopes to offer lessons to development actors grappling with the problem.